1. If you are not already logged in to DealerRater, log in to the Dealer Panel with an account which has administrative access for your dealership. 2. Click “Dashboard” from the navigation bar along the top of the Dealer Panel – you should be directed to your Dashboard automatically each time you log in to your Dealer Panel. 3. Customize: Click the “Customize” button and check-off which widgets should be displayed on your Dashboard. 4. 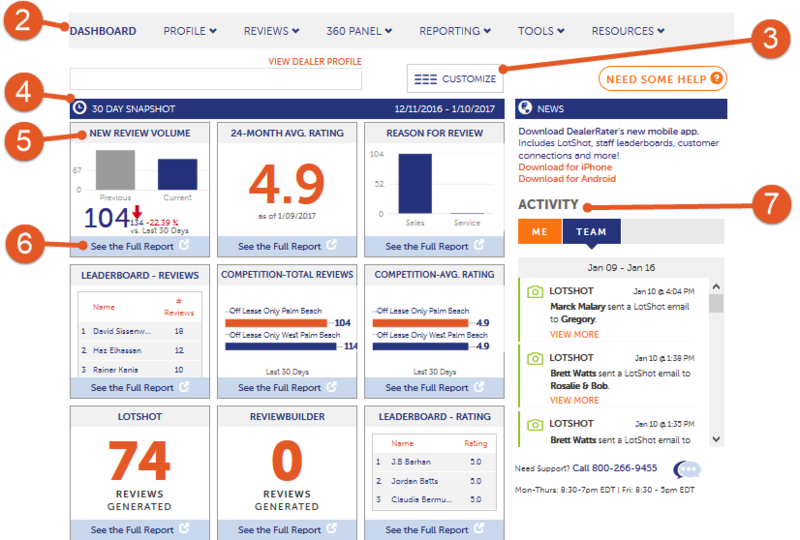 30 Day Snapshot: You can select a number of different widgets (see Step 3 above) to display in this space, providing at-a-glance information about your dealership's performance on DealerRater over the past 30 days..
5. Rearrange Widgets: To rearrange your widgets on your Dashboard, click and drag from the title of the widget to choose its position. Widget configurations are saved for each user individually. 6. See Full Report: To see the complete report and get more in-depth information from each widget, click the “See the Full Report” link for any widget, to be taken to the relevant report in your Dealer Panel.